Entrepreneur and venture capitalist Alexandra Johnson users her bi-cultural background to connect Russians with ideas to Americans with access to money. Born in Vladivostok, a city closer to Tokyo than Moscow, investment specialist Alexandra Johnson has always had an international outlook. Soon after the fall of the Soviet Union, she left for the U.S., where she added a M.B.A from the University of California, Berkeley to her Ph.D. from St. Petersburg State University. Once in California, she found her niche as a venture capitalist helping entrepreneurs from her homeland translate their ideas into profits. The first generation of post-Soviet businessmen were “People who had spent their whole career working for a big state enterprise,” Johnson said. Consequently, entrepreneurs were enthusiastic, but didn’t always know how to turn their concept into a profitable business. Still, these first time entrepreneurs were creative and eager to explore the world of capitalism. One businessman, an owner of a small grocery store, spontaneously pitched Johnson the development of noiseless coffee grinder. “When I'm talking to Russian entrepreneurs the sky is the limit,” Johnson said. However, while many U.S investors were interested in Russia’s business potential following the Soviet Union’s collapse, few had the language abilites and regional expertise necessary for exploring the market. 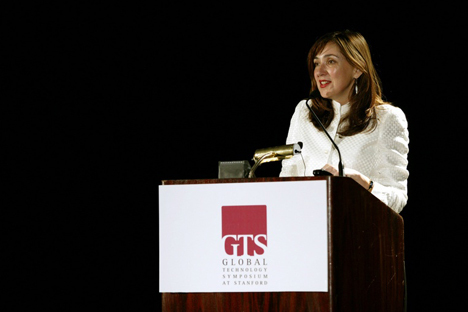 To help U.S. investors and Russian entrepreneurs connect, Johnson founded the Global Technology Symposium (G.T.S. ), now in its 11th year. The conference, held annually in Silicon Valley and sponsored by the likes of tech giant Cisco and Russian retail banking giant Sberbank, has given Russian tech start-ups a platform for finding funding and markets for their services. Despite these sucesses of Yandex and Vkontakte, though, still Russia does not have all the components of a successful start-up ecosystem, Johnson said. Building a new business needs ideas, funding, legal support and a market. Russian start-ups have access to banking services and legal support, but not always a market. Major Russian corporations often refuse to take a chance on a new tech business, prefering instead to rely on more well known partners. Although Johnson envisions gas monopoly Gazprom taking part in the G.T.S. some day, that level of interest from major Russian players is lacking at the moment. Until a more condusive environement exists in Russia, start-ups will continue to look to the West for funding. This year’s G.T.S., which will take place March 26-28, faced additional challenges interesting investors given the tensions between the U.S. and Russia over Ukraine. Multiple Russian firms were expected to issue I.P.O.s this year, only to see those hopes dashed in recent weeks. Johnson notes, however, that start-ups aren’t short-term, market-based propositions, but long-term investments independent of any temporary political tensions. This year the G.T.S. welcomed both a Ukranian and a Russian company, a fact Johnson notes is evidence that innovation can transcend international rivalries. Her own career, spent making connections between the U.S. and Russia, is certainly proof of that.